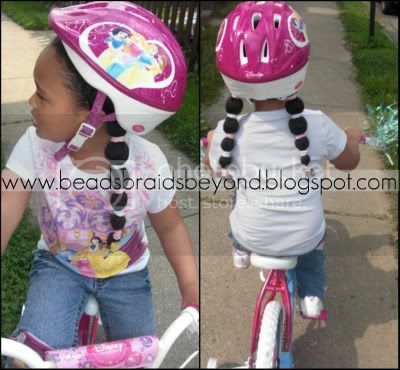 Beads, Braids and Beyond: Banding F.A.Q. Banding is a way to stretch the hair out without the use of heat (flat ironing, blow drying, etc, which may result in heat damage). Why do you band A's hair? I band A's hair because it's easier for me to style stretched hair and from my experience, the final result looks better after being styled on stretched hair. Some people choose to blow dry instead, but I want to stay away from heat as much as possible. After banding A's hair, she has little to no tangles so when I'm styling her hair I don't have to stop to remove knots. This speeds up the process, minimizes breakage and, I believe, helps A retain length. Do you always band A's hair? No. It depends on what style I have in mind. I almost always band A's hair before doing cornrows, sister twists and box braids. I prefer for her hair to be wet/damp if I'm doing regular two strand twists all over, twist outs and braid outs, to name a few. How do you band A's hair? I use cloth covered ponytail holders. They are not all created equal. I tried a different brand last Summer and they caused breakage so I stick with the ones pictured below. After washing and detangling A's hair, I grab a section of hair, add a moisturizer (usually Bee Mine Luscious Moisturizer), put a band/ponytail holder at the base and from there I begin spacing the ponytail holders half inch to an inch apart. I usually do between 3-6 sections on wet/damp hair but I recently did up to 12. The closer you put the bands, the more stretched the hair will be, also, the more sections you do, the more stretched the hair will be. This is completely up to you. I leave the bands in overnight. I also braid the ends that are left out of the bands. Do I have to band? Not at all. There are several different methods people use to stretch the hair. You can do single braids or twists, cornrows, etc. I do 6 single braids once in a while but I find banding works best. When I try other methods her hair usually still has quite a few tangles. For A? No. Like I said, I believe it helps her retain length since her hair is stretched out and tangle free. As previously mentioned, not all ponytail holders are created equal so you have to be careful about which ones you use. As you can see below, these cheap ones I bought from a local dollar store broke her hair off. I also don't recommend using regular rubberbands for banding. Be sure to moisturizer the hair prior to banding. Also, be careful when removing bands and make sure you don't make them too tight. After removing bands, ends still braided. After using the Tangle Teezer. Banded style she wore to school. Banding is indeed one of the best way to stretch hair without heat and its also cute for daily style..but african threading is also a very gud one, esp. for my dd's hair.. When you take the bands out the next day do you put any product in it to style or do you leave it dry? I love banding - definitely one of the best ways to stretch tight curls and coils! A's hair is super long and so pretty!! May I ask what that huge Princess Tiana thing is in the last picture??? I like banding at night although my kids hair is not near as long as a's, it helps keep it tangled free for easy daily styling in the morning for simple pigtails and what not for school. I used to only use those cheap ponytails, I always had to use two or three together to get any hold, and they did always rip their hair out when taking them out. Great post!! This post is so helpful, it's not even funny! Thank you!! So, with that last style (the bands that she wore to school), what would you do that night and the next day? Do the bands stay in? Are you detangling again at all or not until the next wash? I'm gonna have to try the second day banding. Great results! When you get a chance, there's an award for you over on my blog! Hi! I love reading this blog! I get so many great ideas. I have a question. I have a 4 year old daughter who is bi-racial (mexican and black). Her hair type is a 3c. It seems like her hair has been the same shoulder length for 2 years? Why is her hair not growing long? When you remove the bands does it matter if you start from the top-bottom of a section or bottom-top? Do you think removing the bands top-bottom helps reduce the tangles? Hi ladies. This is my first time hearing about banding. How does it stretch the hair? This is a technique I am going to have to try on my hair! Thanks for explaining so thoroughly! By the way I love this website! My husband and I are a bi-racial couple so I am getting many natural hair tips and ideas for when we have kids in the future! really cute. she's a sweetie. I recently tried banding my daughters hair. I used colored bands and a star parting pattern in the back of her head. It was so cute and she got so many compliments that I left it in for 2 weeks. Not a good plan. I used a Shea butter based moisturizer in her hair, but it was so dry and had broken places that I cried when I took it out. I'm guessing banding isn't meant for lasting styles? Any thoughts on that? Hello all, I am new to this blog. only just heard of banding but, another way to stretch the hair out is threading. it is not the everyday thread you use for clothes. it what i grew up with and got my hair very long as a child. unfortunately i didn't have the reassurance that my hair was beautiful natural and relaxed it as a teenager. I am now in my 30s and have transitioned back as a natural. my daughter who is 7 has appreciated that and loves her her natural. Again i made the mistake too to texturise her hair.. yes - i regret it alot. we are now both exploring ways to style our hair naturally and she is loving it. use threading to stretch her hair after a wash.
hopefully her hair will grow back properly soon.. she has a habit of tangling the hair line.. and breaking ends off when she is untagling them.. don't know how to stop her doing that... and advice will be nice..
Hi Bukky, I'm Nigerian and had my hair threaded as a child, want to thread my DD's now that you mentioned it. Any tips? My DD is 10 months and she is not bi-racial. where did you purchase the ouchless bands from? Oh Thank You! I'm definitely going to try Banding on my daughter's next wash! Just found your site...love it & thanks for this. Would this work on 3a hair ? I love your blog! I've told my sister-in-law about it & she's tried some of the products you use on my niece's hair, which is getting pretty long now. Hopefully, I can get her to try banding. I know I definitely will for my own hair this summer! I'm a regular at the beach & need a way to style it other than doing lots of double strand twists. I do not have the time to spend hours on end every week doing my hair! Thanks for the faq's & your work is awe-inspiring. Jamaican Black Castor Oil is supposed to thicken hair well, I haven't used it yet, but I'm gonna order some. Yes, thx for this blog. DD is 10 months and I can't wait to try these styles later when I learn how to braid and keep DD's hair moisturized. I believe she is too young for the products you,ve mentioned. I use argan oil, shea butter and oilve oil.